The Final Steps. . . . .
Today (Sunday) I prepared to glue on the neck. First, I had to make a couple of cauls for gluing on the fingerboard extension. 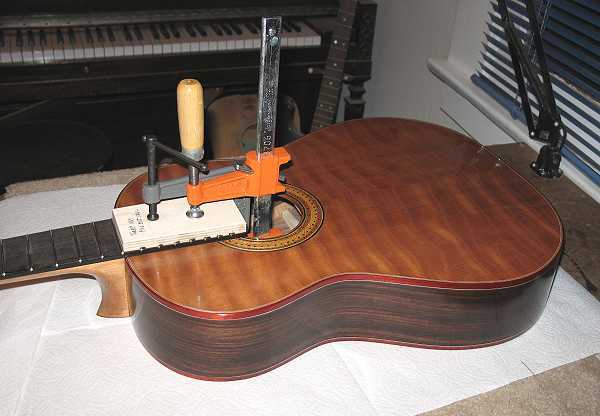 Then I bolted the neck on and used my Exacto knife to carefully scribe around the fingerboard extension. 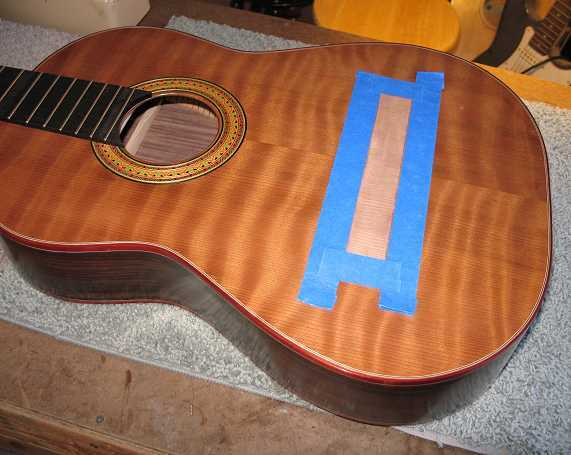 I removed the neck and then used paint stripper to remove the finish within the scribed lines. After very carefully scraping off the bubbled finish with a 1/2" chisel, I wiped the area with a dampened paper towel, to neutralize any possible remaining stripper residue, and set it aside to dry. After about 15 minutes, I put glue on the fingerboard extension, bolted the neck on, and applied the cauls and clamps, as you see below. People often see my workroom pictures on this website and comment to me on how tidy everything is. Ha! 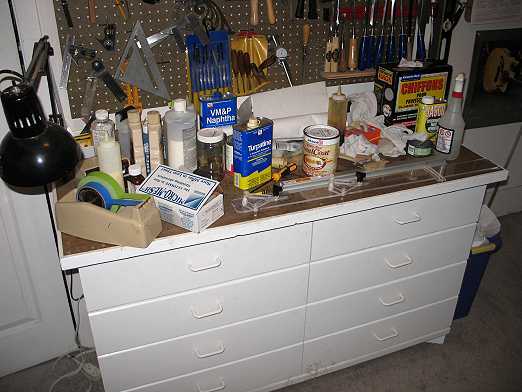 This is what my workbench looks like at the moment. A bit of a mess, huh? Today I spent about an hour or so leveling, crowning, and polishing up the frets, and cleaning up the fingerboard surface. 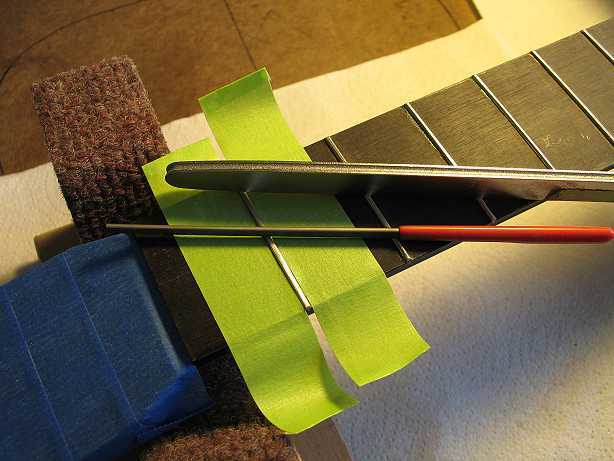 Below are the two tools I use to crown the frets and round the fret ends. After I did all that, I used 400 wet/dry sandpaper, then 600, and finally the white 3M synthetic steel wool (equivalent to 0000 steel wool). Then I did a final sanding of the ebony fingerboard and put some lemon oil on it. The next thing I did was to figure out exactly where to place the bridge. 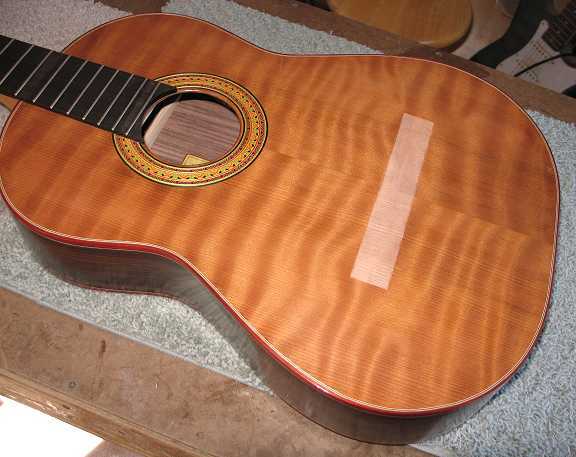 Most sources I found seemed to say that 2mm compensation is about right for a 650mm classical guitar, so that's what I did. I located the bridge so that the front of the saddle slot was at 652mm from the nut. Holding the bridge in place with a few layers of masking tape against its corners and edges, I scribed the bridge outline with an Exacto knife. Then I used some Zip-Strip paint stripper to remove the finish, scraped it carefully away with a 1/2" chisel, wiped the scraped surface with water (to neutralize any remaining stripper residue), and set it aside to dry. While it was drying, I made a few cauls for the top of the bridge. Here I have built up about four layers of masking tape around the bridge-gluing area. 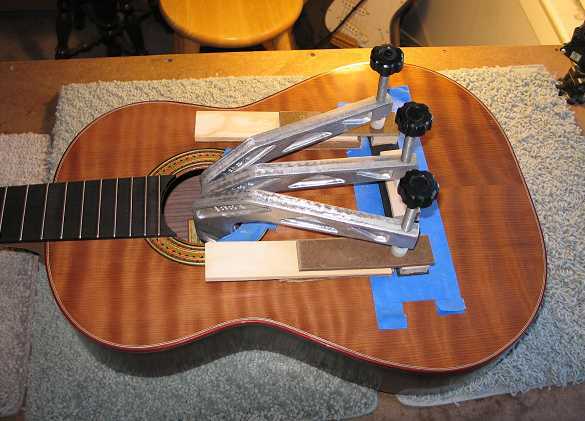 Here is the bridge all clamped up. My middle bridge clamp just reached the center section of the bridge. I had to clamp the two outer sections a bit differently, as the clamps didn't quite reach the center of the bridge at those two ends.